Your kitchen is the command center of your home and it is essential to have adequate illumination for everything you do in this space. Installing layered lighting to create a well-lit room can make tasks like meal prep and cooking more safe and enjoyable. With more than 50 years of experience in the lighting design industry, the experts at M&M Lighting can help you strategically choose the right fixtures to best suit your family’s needs. Schedule an appointment with one of our sales consultants today! In a prior blog, we discussed the importance of layered lighting in your home. Today, we’ll describe these layers and explain how you can achieve stunning layers of illumination in your kitchen. Keep reading to learn more. When you want to ensure that your kitchen has the right lighting for every task, it is important to consider the three important components: ambient lighting, task lighting, and accent lighting. Task lighting: Appropriately named, this layer of illumination ensures that you can see clearly to complete specific tasks in your kitchen, such as preparing meals. Accent lighting: Often referred to as decorative lighting, this type of lighting is great for showcasing interesting features in your kitchen. Now that you are more familiar with the three basic layers, you might wonder how you can easily incorporate them into your kitchen. By selecting the right combination of lighting fixtures, creating layered lighting in your kitchen is easy. If you have questions about what types of fixtures will work best in your kitchen, our team is happy to speak with you about the room’s dimensions, your style and decor, and other factors that can influence your design choices. If your kitchen has enough windows, you may receive enough indirect lighting from outdoors during daytime hours to safely navigate around your kitchen without turning on the lights. However, if you don’t have any windows in your kitchen or you are walking into your kitchen at night, you want to be able to see where you are going. With the simple flick of a switch, ceiling fixtures like recessed lights, flush mounts, and semi-flush mounts wash the space in light, providing adequate illumination for general tasks like getting a drink of water or grabbing a quick snack. Installing a dimmer switch can be an effective way of controlling the intensity of the ambient lighting in your kitchen, and it can be easier on your eyes. 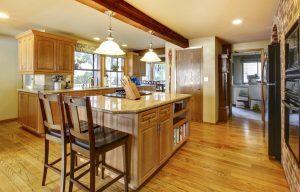 Many of the detail-oriented tasks that you complete in your kitchen take place on the countertops or in front of the sink, and having sufficient task lighting is very important for completing specialized tasks. Activities like chopping veggies for your favorite meal and washing sharp knives by hand can be difficult, and even unsafe, without adequate lighting. If you have a kitchen island, pendant lights are a stylish way of lighting up your food prep surface. Under-cabinet lighting provides the same benefit for homeowners who don’t have an island or prefer to do their food prep on other available countertops. Installing directional downlights at the right angle above your sink can provide the lighting you need to safely and effectively clean everything from dishes to produce. Once you have selected fixtures that will provide adequate ambient and task illumination, you might begin to think about what types of features you would like to showcase in your kitchen. Do you have interesting alcoves built into various walls in your kitchen or specialized cabinetry that allows you to display the fine dishware you have collected over the years? Maybe you have stunning pieces of artwork from your favorite artist on the wall that you would like to highlight. Installing spotlights in alcoves is an excellent way to showcase interesting architectural details in your kitchen, and installing LED dot lights in your display cabinets will allow you to call proper attention to your display items. Likewise, wall lights like sconces and picture lights provide affordable and effective illumination of your prized decor items. Whether you are choosing lights for the kitchen in your new home or you are considering replacing your old, outdated lighting in your existing kitchen, the experts at M&M Lighting are here to help you! With thousands of in-stock fixtures to choose from, you’re sure to find everything you need to successfully create the right balance of ambient, task, and accent lighting in your kitchen. Browse our impressive online inventory and contact us to schedule an appointment with a sales consultant today. 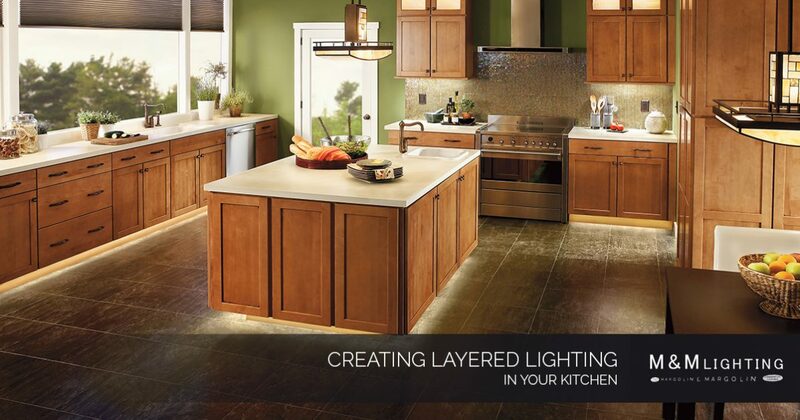 We can’t wait to help you choose the best layered lighting for your kitchen!